Dano was messing around the shop the other day, and came up with a really interesting concept. He took the end of a zip tie (the part that isn't serrated), and trimmed the profile to be the shape of a lock pick. Sure enough, it worked, but not terribly well. I could only get a few uses out of it before the zip tie became too floppy. The shape is easy to make, yet difficult to reproduce exactly. I encounter the same challenge when making metal picks. They're easy enough to form quickly by hand, but they're impossible to duplicate precisely. 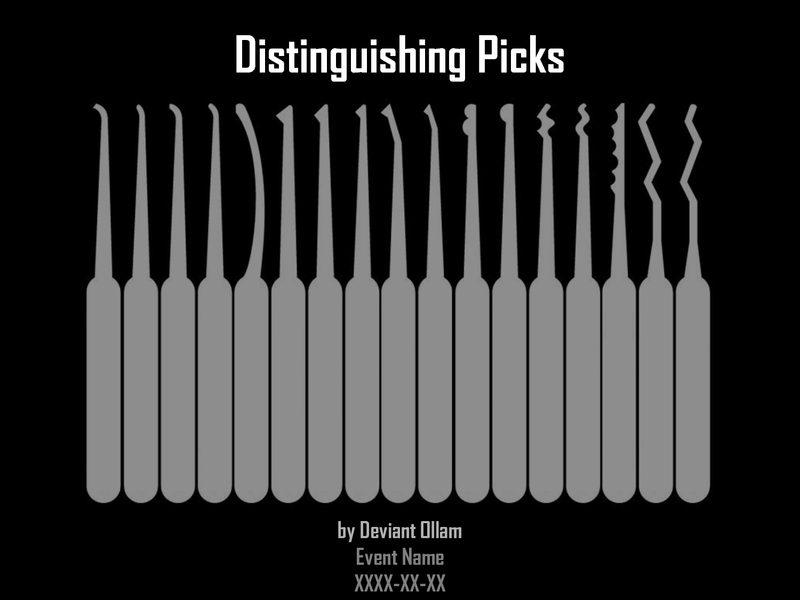 When the performance of the pick is so dependent on the exact shape of the pick, consistency is king. Also, the TSA sometimes has difficulty with metal picks in my luggage, perhaps plastic picks can solve that. After a few days of simmering on those thoughts, something dawned on me. 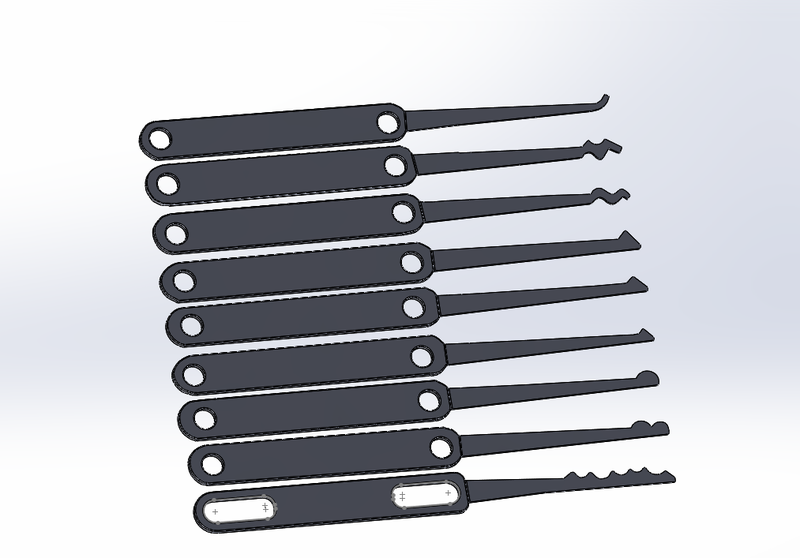 "Hey, those fancy 3d printers, I bet those could produce some awesome lock picks!" Creating the shape was no problem, due to a quick Google search and a really neat, obscure Autotrace tool in [redacted modeling software]. My package arrived in the mail Saturday afternoon, and with a singleminded focus, I dove straight into the play locks. Within a few moments, the good ol' Defiant lock gave up the ghost, and my compounded excitement manifested in screaming "Got it!" at the top of my lungs. Of course, these picks were far from perfect. Scaling was a bit of a problem, as only about half of the picks were appropriately sized to fit the locks on hand. One neat thing about designing these digitally, is that making scaled copies is a piece of cake. I also successfully broke two picks within 15 minutes, far from ideal. 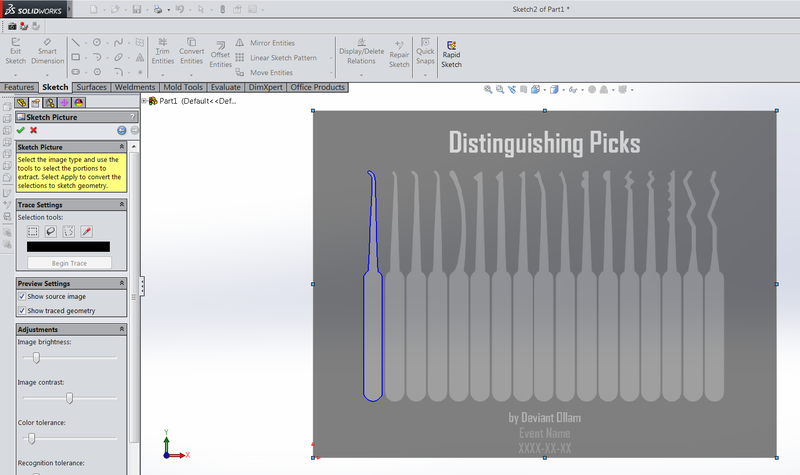 The next step is to try a few iterations of these picks, perhaps including some new designs, to get a kit of a dozen or so nice picks of different sizes and shapes. Once we have that, then making an injection mold shouldn't be much more difficult. Then we should be able to produce many perfect copies at a trivial cost.